Travel website TripAdvisor serves as a great platform for hospitality businesses looking to connect with travelers. TripAdvisor lists more than 8.1 million accommodations, airlines, experiences, and restaurants. And the site attracts an average of 490 million unique visitors every month. TripAdvisor ranks ahead of personal recommendations, tourist board websites, and guidebooks as the most trusted source for travel planning. 83 percent of consumers say TripAdvisor reviews make them feel more confident in their travel decisions. Meanwhile, 96 percent of hotel and hospitality brands worldwide say that TripAdvisor reviews are influential in generating bookings. This makes it crucial for business owners and marketers to claim their business on TripAdvisor, manage their information on the website, monitor and respond to TripAdvisor reviews, and drive engagement with the travel website’s community of travelers, users, and reviewers. 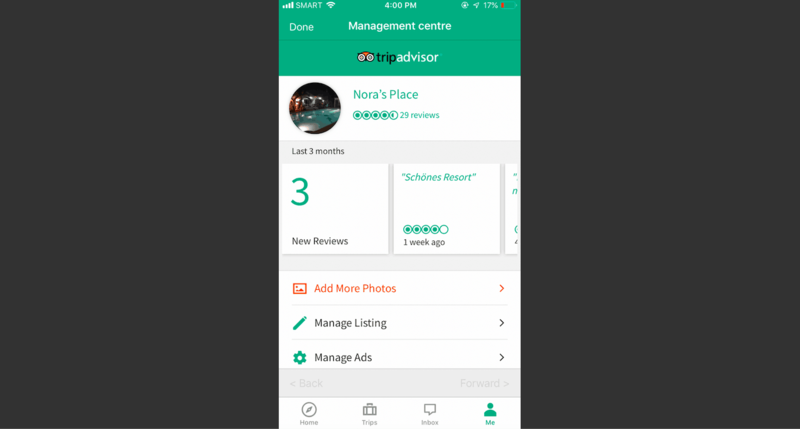 If you don’t have a lot of time to sit in front of a computer and manage your TripAdvisor business listing, you can still do it on the go, using your phone or tablet. The TripAdvisor owner app can be downloaded simply by searching for “TripAdvisor” on your phone’s app store. It’s free. Yes, it’s the same consumer app that travelers use to search for hotels, restaurants, flights, and experiences. 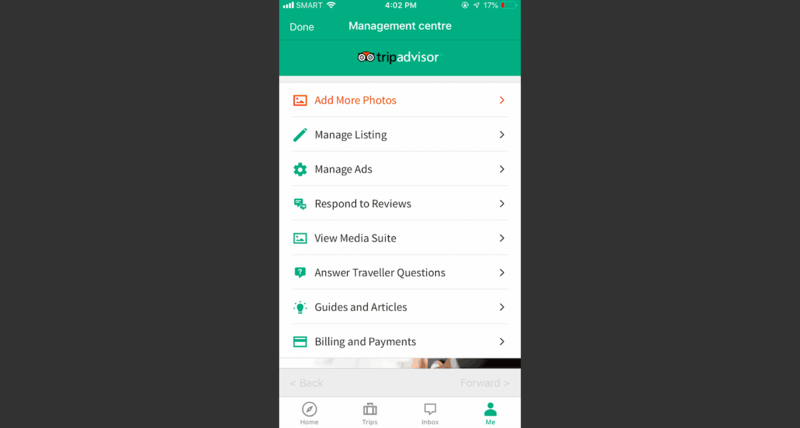 But it’s a TripAdvisor owner app, too, because it features a mobile Management Center experience within the app. Respond to reviews. 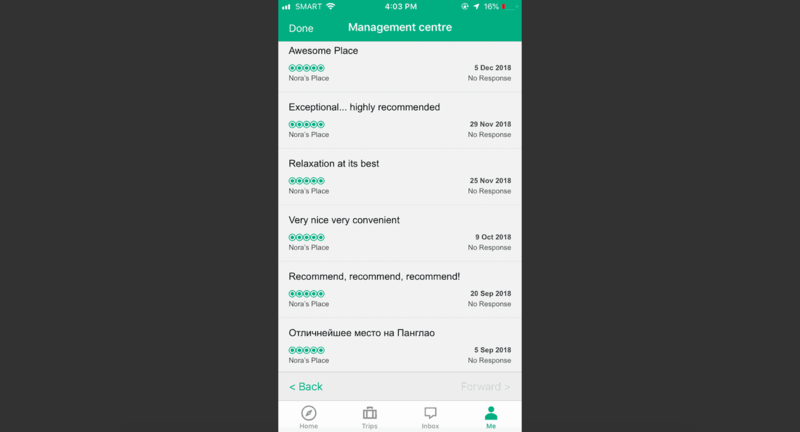 Quickly read and post Management Responses to recent reviews on TripAdvisor, plus see the status of past responses. Update business information. Easily update general information about your business, including amenities and features. Answer guest questions. Answer the questions posted by travelers on your TripAdvisor business listing in just a few clicks. Upload and manage photos. Add photos right from your phone or manage the images that have already been uploaded. Review bills and payments. See your latest billing statements and payment receipts (if applicable; for example, if you’re using TripAdvisor Instant Booking). 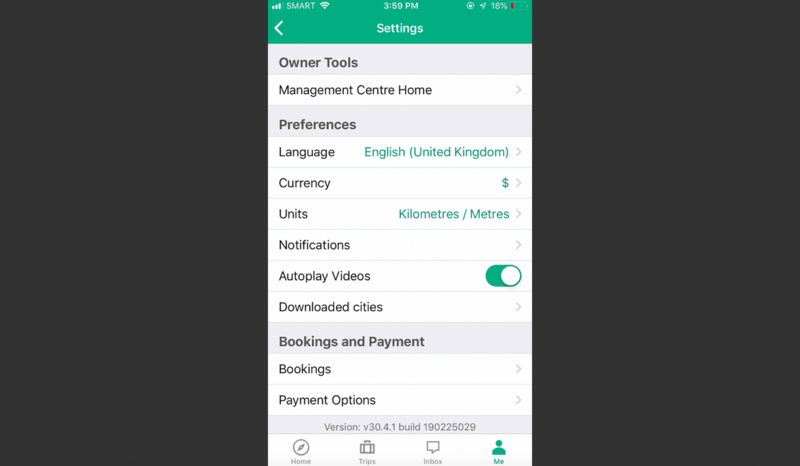 Before downloading and using the TripAdvisor business app, first make sure that you’ve claimed your property or business at: https://www.tripadvisor.com/Owners. Once downloaded, open the app and then click the “Me” tab in the bottom right corner. Once signed in, click the “Me” tab again, then click the gear icon to display “Settings.” Select “Management Center Home” from Settings and choose the property you’d like to manage (if you have more than one). 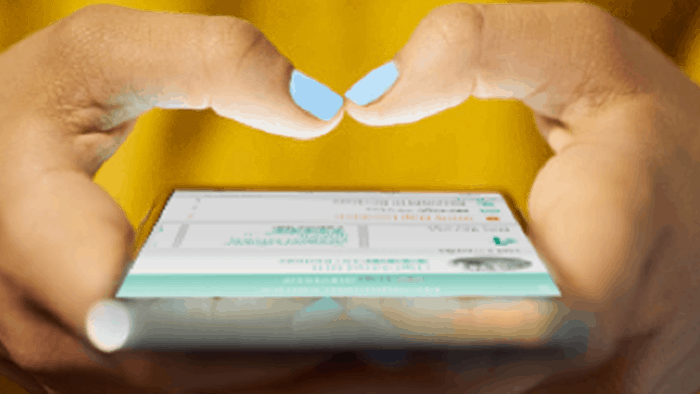 This will launch your mobile Management Center. 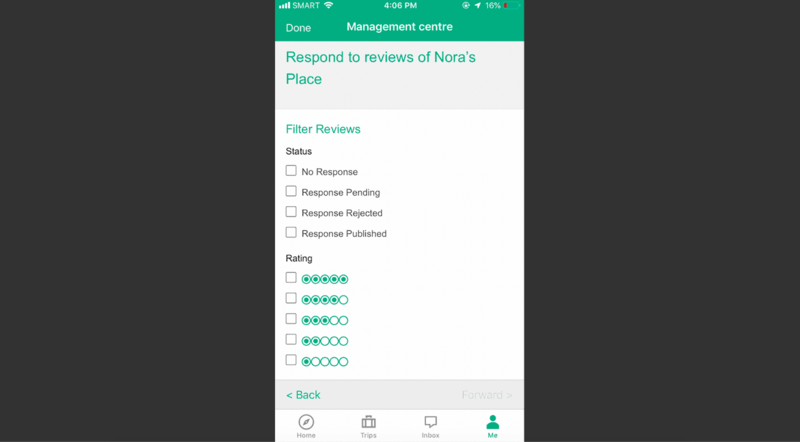 Click on “Respond to Reviews” from the list of options on your Management Center. This will launch a page displaying your most recent reviews. Along with the reviews, you will also see each review’s rating, as well as the status of the review (if it has been responded to or not). You can also apply a filter on reviews by status. Status of reviews can be: no response, response pending, response rejected, or response published. Remember: responding to TripAdvisor reviews can help improve your performance on the site. According to research, hotels and accommodation properties that respond to reviews on TripAdvisor enjoy 17 percent higher engagement levels and are 21 percent more likely to receive a booking inquiry than those who don’t respond at all. Also, properties that respond to 65 percent of their reviews receive an average rating of 4.15, compared to only 3.81 for those that have not taken the time to get back to their reviewers. Pro tip: Be sure to set up TripAdvisor alerts that notify you of new reviews. 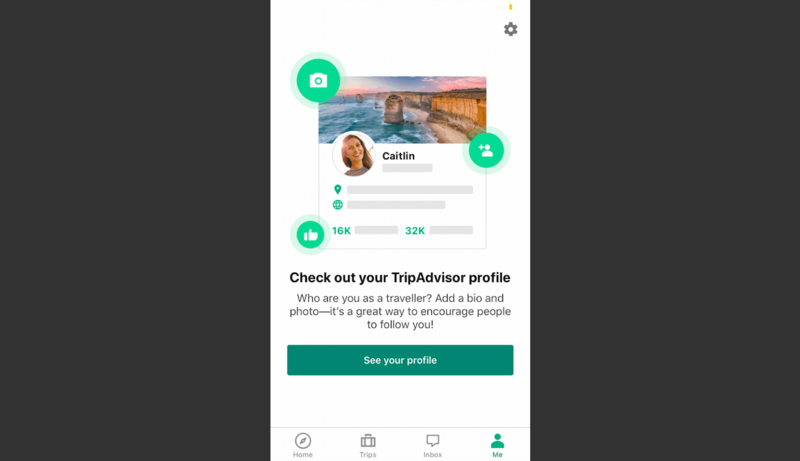 Even if you’re away from the computer, or if your TripAdvisor owner app has been set to deliver notifications quietly, you can still stay on top of what customers are saying on the site.